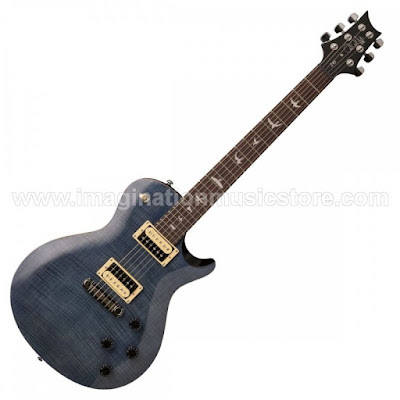 The PRS SE 245 solidbody electric guitar delivers the classic dual-humbucking, singlecut tones everyone loves in a high-quality, high-value package. The comfortable single-cutaway maple-topped mahogany body and wide-fat profile neck deliver great playability and warm, detailed tones. The shorter 24.5" scale length of the 245 makes bending easier and gives your strings a slinkier feel. The headstock has been redesigned to now sport Paul Reed Smith's signature, adding extra "cool" factor. And a pair of SE 245 humbucking pickups gives you all the clarity and punch you need for everything from high-gain rock to clean, smoky jazz. The PRS SE 245 is an affordable tone machine that's ready for any gig. Neck shapes are critical to your playing experience and a hallmark of PRS quality. The PRS SE 245 is fitted with their wide-fat neck profile. Perfected after years of prototyping, the wide-fat neck is based on designs Paul Reed Smith did in the '70s and '80s for Carlos Santana, Peter Frampton, and Howard Leese of Heart. The SE 245's rosewood fingerboard is smooth and warm sounding, and the iconic bird inlays are the calling card of this top-notch guitar maker. guitarists immediately noticed the ability of these pickups to conjure mellow chords one minute and punch the front of an amplifier for high-gain tones while maintaining attack and clarity the next. And the mahogany body ensures these pickups deliver the full low-mid tone that fattens all of your single-note playing for singing sustain. The SE 245, like all PRS guitars, is designed for top-notch performance right out of the case. Since 2001, the SE Series has provided excellent tone and playability at an incredibly affordable price point. Constructed from quality tonewoods and components, these instruments carry on a commitment to quality that's been the brand's hallmark since Paul Reed Smith started handbuilding guitars for some of the most elite players in the world. The SE 245 delivers classic humbucking tones at a great value.